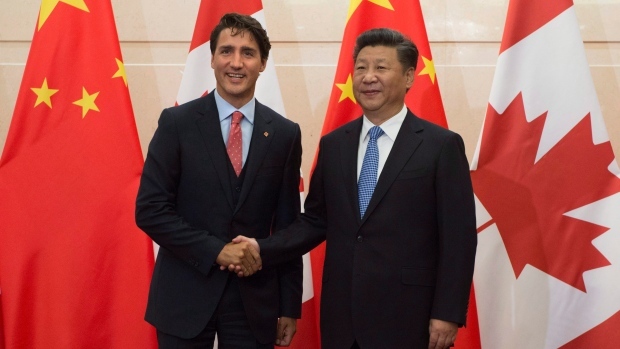 A majority of Canadians believe trade shouldn’t be the biggest consideration when assessing the country’s relationship with China, according to a new Angus Reid Institute poll. The results, released Friday, reveal 62 per cent of respondents said China’s record on human rights and the rule of law should be more important to Canada than trade investment and opportunities which accounted for 38 per cent of people polled. The findings come amid mounting tensions between the two countries over the arrest of Huawei Technologies Co. CFO Meng Wanzhou in December, which have put the possibility of a Canada-China free trade deal at risk. China is Canada’s third-largest trading partner, followed by the U.S. and European Union. Total trade between the two countries was worth nearly $70 billion in 2017, according to Statistics Canada. Respondents who identify as Conservative were more likely to favour trade (55 per cent) over human rights (45 per cent). Meanwhile, 73 per cent of Liberal respondents prioritized human rights over trade (27 per cent). The poll was conducted from Jan. 23-28 among a sample of 1,700 Canadian adults.